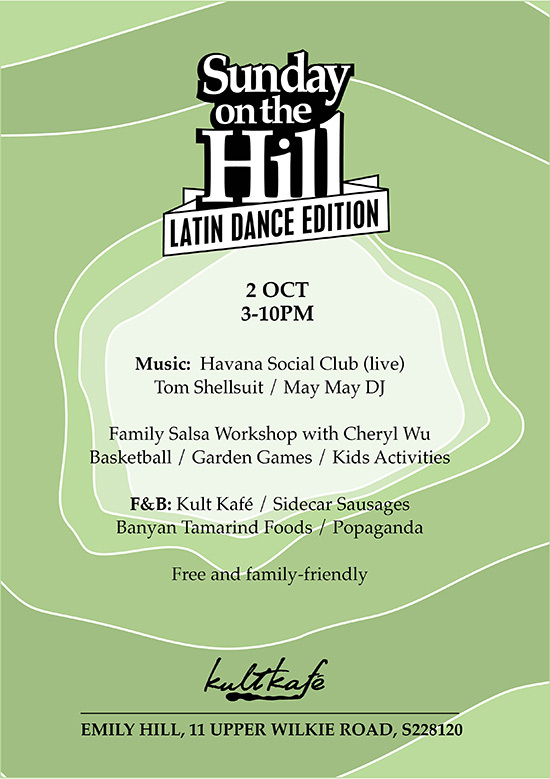 We’re teaming up with Salsa Under The Stars SG for a special Latin Dance Edition of Sunday on the Hill! Featuring music from Havana Social Club, May May DJ (Salsa Under The Stars), and DJ Shellsuit (Sideshow). Expect salsa, merengue, bachata, kizomba, cha cha, cumbia and more in the mix. Family-friendly Salsa workshop at 3pm with Cheryl Wu Dance Studio ($5 to participate). F&B by kult kafé. Sidecar Sausages, Bayan Tamarind Foods andPopaganda. Gourmet sausages, great veggie options, fresh fruit popsicles, craft beers and refreshing cocktails. Basketball, kids activities, pool table and plenty of space to stretch out and chill. Download the WAAVE app for quick and easy cashless payment. Sunday on the Hill is a free-entry and kid and dog friendly event.